Zito Partners has added to its team of public relations professionals with two new hires, including a partner who will work on the firm’s real estate accounts. The Warren-based PR, marketing and crisis communications firm announced the addition of David Allan and Amiee Watts. Both are industry veterans with financial expertise, joining the business as partners. Watts joins Zito Partners from JConnelly, where she most recently served as vice president, financial. She brings nearly 20 years of experience in strategic communications and will work with clients such as Edgewood Properties, Hard Rock Hotel Casino Atlantic City and PS&S. In her previous roles, Watts was the lead on several financial services accounts, including Federated Investors, Aegon Asset Management and FundX Investment Group, according to a news release. She has specialized in representing asset managers, mutual funds, fintech companies, private equity firms, hedge funds and financial advisers. 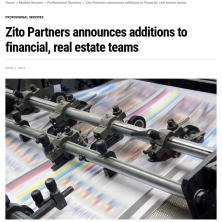 “In bringing David Allan and Amiee Watts to Zito Partners, we can further provide our clients with in-depth, unmatched expertise, and prepare us for additional growth,” said Deborah Kostroun, managing director of Zito Partners. Allan joins Zito Partners after 18 years with Ketchum, where he was senior vice president, investor relations, and a senior member of the firm’s financial communications unit in New York, the news release said. During that time, he worked on financial communications for clients such as Procter & Gamble, First Data Corp., Western Union and others, while working on transactions such as initial public offerings for Zoetis, Allison Transmission, Mead Johnson Co. In 2014, Allan helped Ketchum form its strategic alliance with Zito Partners, Ketchum Zito Financial, which provides boutique and special situation counsel and support for clients of both organizations, the news release said. The group also serves new clients that need the experience of the Zito Partners team with the global reach of Ketchum. “David and Amiee will both play vital roles in expanding Zito Partners’ offerings,” said Robert Zito, founder of Zito Partners. “We are increasingly asked to help with strategy and issue management for our clients and our team has evolved to provide that counsel.